Fairy gardens are a great way to get your imagination going and get little kids interested in gardening. But it’s not only a fun gardening activity for the whole family. It’s also a creative idea for putting broken or old items around the home to good use rather than throwing them straight to the trash bin. 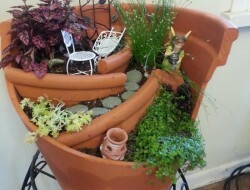 Let your imagination run and see if your broken terracotta pots can still be used to hold a fairy garden! Also don’t buy decorating materials just yet! 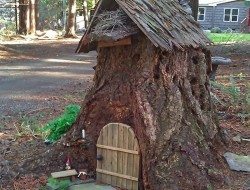 Small, broken tiles and other scrap materials from a construction or renovation project in your home can be used to create the pathways or mini house in your fairy garden. Your grown up kids might also have small toys you can use to add more life into your creation, like mini people and furniture. A walk in your local area is also sure to bring you some interesting rocks, sticks or tiny plants to add to your masterpiece. A fairy garden is indeed a fun, creative, adorable and inexpensive idea to add more greens at home. What’s not to like? Be inspired by more fairy garden ideas by scrolling down our list below!